The Forgotten International: The international anarcho-syndicalist movement between the two World Wars by Vadim Damier [Забытый Интернационал: Международное анархо-синдикалистское движение между двумя мировыми войнами. Дамье В. В.]. It is rather ironic that the history of the anarcho-syndicalist International Workers’ Association (IWA-AIT) was written and published in Russia, where historically anarcho-syndicalism failed to make serious ground. 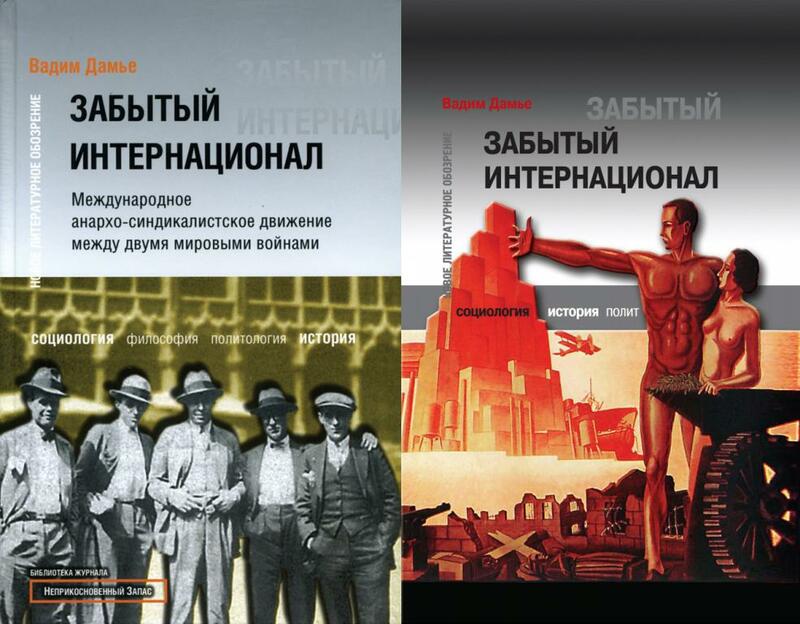 But be it as it may, the most detailed and voluminous history of the AIT was recently produced in Russian by Vadim Damier, a historian and anarchist activist since the late 1980s. The first volume of this enormous historical study was published in 2006, the second volume being issued last summer (2007) and totals over 1,600 pages in all. The book deals with the history of the AIT in its heyday – the period between the two World Wars – but also traces the origins of the movement in earlier revolutionary syndicalism and speaks of some of the post-WWII developments and why the movement has never recovered from the blow it received in the 1930s. While there have no doubt been some well-known accounts of the history of the AIT, such as Rudolf Rocker’s “Anarcho-syndicalism” (1938) or some later studies, such a scrupulous account of the development and the ideas discussed within the anarcho-syndicalist movement, had never been attempted. It is true, as Damier states in the preface to the book, that some serious studies have been made on the Spanish CNT, for example, or other national anarcho-syndicalist unions. But anarcho-syndicalism as a worldwide phenomenon has not been analyzed well enough. And in fact there was a large obstacle to that. As the movement was physically swept away in many European countries during WWII, its documents and archives were scattered around or sometimes destroyed as in Spain, the movement’s stronghold, or Germany, where the AIT secretariat was located before the ascent of the Nazis to power (its archive is believed to have been destroyed). The largest – but hardly complete! – collection of documents is now to be found in the Amsterdam IISG. But there are other collections, including that of the Russian state archive of social and political history (RGASPI), which holds the documents of the Red International of Trade Unions (Profintern), the Communist-led organization which tried to take over parts of the syndicalist movement in the 1910-20s. The author has also worked extensively in the various German archives, which contain fragmented documents from the police and German Communist Party archives, as well as in the CIRA and with materials provided by fellow anarchist researchers in different countries. The result of this work looks impressive. The study operates with a large selection of documents of the age, both published and unpublished, in major European languages to produce a thorough analysis of the origins and development of anarcho-syndicalism within a broader historical context. It studies both the organizational development of anarcho-syndicalist unions, their day-to-day struggles in various countries, discussions which were taking place within various national sections of the AIT as well as the international congresses. Damier’s book doesn’t confine anarcho-syndicalism to some European countries only and also studies the movement in Latin and Northern America, as well as in China and Japan, providing some really valuable contributions. What is probably more important, is that it is not a mere description of historical facts and head count of the members of anarcho-syndicalist unions. It places the movement within its historical context, but also looks at it from a historical perspective – years after the tragedy and catastrophe of anarcho-syndicalism it is necessary not only to state that it fell victim to authoritarian regimes and the World War, but also try to understand why it has never recovered from this afterwards. And the book certainly contains a wealth of material on the various opinions within the anarchist movement, including the debates on whether fascism was the “lesser of two evils” or the “self-criticism” of syndicalism and industrialism as proposed by the Argentinian FORA or the Japanese anarcho-communists of the 1920s. Some of the debates are still relevant today. One may regret that the study was produced in Russian, a language which not many foreign researchers and activists are familiar with, so if you would like to contact the author about the possibilities of translating the book into other languages and publishing it, you can write to Vadim Damier at vaddam@mail.ru. A very good book. I was translating it with somebody but I have no possibility to finish that work anytime soon. Maybe somebody else can do the job. Just too long and I have so much to do. Several sections of the work have been translated into English – perhaps this material should be posted online? Preparing an English translation involves more research than actual translating, because the books are full of names of people, places, organizations, events, etc. which have been transliterated into Russian from many different languages and for which the proper English equivalents must be found. Thanks for making the effort trying to get this translated to english. Please consider uploading your efforts - even if these translations (and the original russian source material) are noted as incomplete (work in progress) and (as yet) draft versions?